Listed on this page are animals that have been approved for adoption following the rescue and rehabilitation process at M&M. If you have questions about any of these animals regarding potential adoption, please contact us! M&M is also looking for foster homes! If you are unable to adopt at this time but would be interested in fostering one of our adoptable animals, please reach out and we will provide additional details regarding the foster approval process. Renegade was rescued from a brutal Louisiana kill pen. He is a 15.2hh American Paint Horse gelding, foaled in 2000. If you have visited M&M Acres, you have probably encountered Renegade - when he is inside, he is constantly looking for someone to pet him. He loves attention and loves kids! Prior to his life at M&M, Renegade sustained a left shoulder injury that did not heal properly. He has no muscle mass in that shoulder, so he is no longer rideable. He also had a cancerous growth in his left eye that was removed at the University of Illinois. It was squamous cell carcinoma, which is common in white-faced horses. If he wears a UVA/B mask, the cancer is unlikely to return. QUICK FACTS: Not rideable, but loves having a job. Loves kids. Gets along well with most horses. Stands nicely for vet, farrier, and chiropractor. Paris will excel with an intermediate-advanced rider. She is very forward and fast. Sound at the w/t/c. She would do well in any discipline. She hauls well, behaves for farrier, and isn’t spooky. We have not yet bathed her or taken her on trail. Charlie is a beautiful bay with lovely movements and a sweet personality. She does have issues with her hocks and is intermittently unsound. Radiographs can be provided. She is comfortable and does well on Equithrive supplement. She will do best with an intermediate rider, as she can get a little excited. She is barefoot sound, hauls well, easy for farrier and vet, and is good for baths. Brandy is an quarter horse mare in her late teens. She was sent for retirement from the Hansen Center for Therapeutic Riding. She is quiet and suitable for small children. She has navicular, but is sound enough for light riding by small riders. She is wonderful on trail, loads and hauls easily. She stands nicely for the farrier and vet. She would be best suited for a mostly pasture, minimal riding home. She stands 15.1 hh. 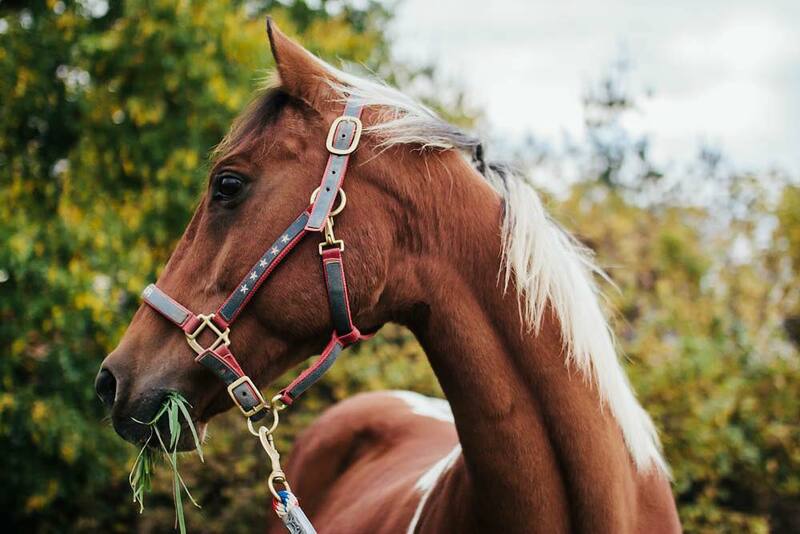 Brandy typically prefers people over other horses, and she loves food! Miss Belle Rae (Belle) was rescued from a kill pen in Oklahoma. She is a Belgian Draft horse. Large horses are purchased quickly by kill buyers due to their weight. Luckily, she wasn’t in the kill pen very long. Her old owner tracked us down and told us she sold Belle to who she thought was a loving home. M&M offered to return Belle to her previous owner, but her owner declined as she could not afford Belle due to a divorce situation. Belle was used as a vaulting and parade horse in Nevada! Belle requires an intermediate rider as she’s very forward moving. After about 3 miles on trail, or 45 minutes of arena work, she becomes sore. She has some arthritis in her hips. She would be best suited for a light riding, w/t home. Trifecta is an Argentinian Polo Pony mare, standing about 15hh. She is around 30 years old, but still has much pep! She is a little forward moving, so would need an advanced beginner rider. She can handle a weight limit up to around 100 pounds. She has been used in our lesson program for several months. Don’t let Fern’s age or size fool you. She is small but mighty! She still races around like a filly and kicks up her heels. We don’t have many photos of her alone, as she’s always right next to her best friend, Trifecta. She is broke to ride, though would need a refresher course. We would really like to see Max and Ember homed together. They are best friends. Ember is a QH mare, around 15.1hh and in her upper teens to early twenties. She is beginner friendly and neck reins. She’s quiet and a favorite amongst our lesson students. She’s good on trail and very quiet. Maximus is an Azteca gelding. We are guessing he is in his twenties, but has cribbed so much that his teeth are nubs. Since coming to M&M, his cribbing is very, very minimal - so much so we don’t even use a cribbing collar. He is very quiet and beginner friendly. His weight limit for riding is 50 pounds and walk, minimal trot only. Both are great for the farrier and vet. Both load, haul, and bathe well. These are two of the sweetest horses at M&M and deserve a superb home. Cookie is an Appaloosa mare in her late twenties, standing 16hh. Cookie is an owner surrender; she was a livery horse at a very busy facility. After a severe active cellulitis infection, Cookie became difficult to handle by beginner riders and the workload was too heavy for her. Cookie needs home with lots of turnout time to promote circulation in her leg and prevents swelling and infection. Her legs must be checked daily for cuts or abrasions and wrapped when she is stalled. She has not had an active infection since 2014. Cookie loves attention, and is looking for a home where she can be a pasture puff with constant love and affection. Tinsel is a 10 year old Shetland Pony. Upon her arrival to M&M she had a severe parasitic infestation and ulcers. She was still nursing her foal and was so emaciated that our vet gave her a body score of “2.” Her hair was very long and more matted than our staff had ever seen in a horse. We had to shave her, which she was not a fan of! Tinsel was treated for both the parasitic infection and ulcers. Her hair was shaved and has grown back. She and her foal, Dreidel, were slowly separated from each other. Tinsel is now healthy and had obviously gained weight. Tinsel is broke for pony rides. She would be a great project pony to be whoever you want her to be. She is dominant in herds. Annie and Lucky were rescued from a man who no longer wanted them. He had Annie, Lucky and a third pony. He said if they weren’t picked up in a certain period of time, he would put them down. Sadly, despite clearly stating all 3 ponies would be homed, he put the third pony down. Luckily, Annie and Lucky were saved and later came to M&M. Annie is very sweet and willing to learn. Lucky is a spitfire. Lucky is an escape artist and able to escape from many enclosures! Annie and Lucky must stay together. Annie is broke for pony-rides and can pull a cart. She is in her mid teens. She stands about 34” tall. Lucky is a spitfire and escape artist. She would make a good project pony. She’s about 10 years old and stands around 32” tall. Snowy was surrendered by his owner who was forced to give him up during a divorce. Snowy is stunning - all white with a cream colored medicine hat and two blue eyes. We believe he is a cryptorchid stud. While his previous owners believed him to be gelded, Snowy acts very much like a stallion. He is currently living with Schwarber the goat. He is very sweet and loves to be brushed. Being so stud-like, he is not broke to ride for children. He does pull carts at our public events. Snowy is in his early teens. Dax’s previous owners could no longer keep him so he came to live with us at M&M in hopes of finding a forever home. 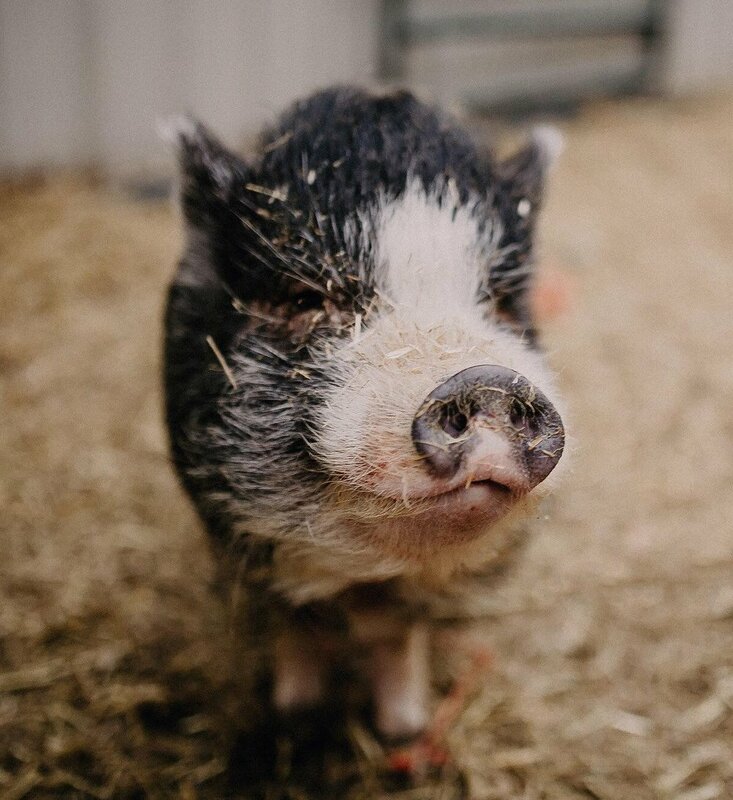 Dax was born in 2014 and is a male potbellied pig. Dax needs an owner who has pig experience and will take time to understand him/help him adjust to a new home. He is very sweet and loves to snuggle once a trusting relationship has been established. He will even follow you around and come when his name is called! Dax currently lives with 3 other pigs at M&M (all adoptable - watch for upcoming posts!) He requires an experienced pig, no children home. 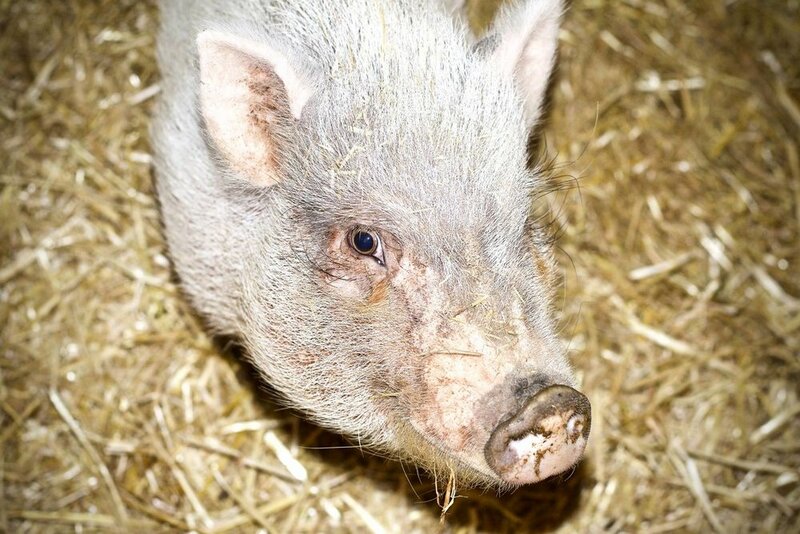 Dax is a very sweet, smart pig - could you be the one to give Dax a home? Pinky Pie was an owner surrender and would do best in an indoor home. She is about 3 years old. Pinky Pie desperately wants a person of her very own. Her owner was expecting a baby and surrendered Pinky, who had been a spoiled pig until then. Pinky is a prime example of the emotional intelligence of pigs. While she is sweet and enjoys attention, we don’t feel she’s found her perfect match. Maybe you will be her zing? Petunia came to us in the middle of winter, shortly after giving birth to a littler. Sadly, due to weather conditions, only one of her piglets survived. Petunia would love to be homed with her best friend, Penelope, preferably in a home with no small children. Penelope was an owner surrender due to zoning issues. She can be nippy, so will do best in a home with no small children. She would love to go home with her best friend, Petunia. Frannie and Bernice are best friends! They are at M&M temporarily until they find our forever home. These lovely ladies had a home and family, but due to a move, these loving piggies were surrendered to M&M. They have adapted to farm life just fine, but wouldn't mind being house pigs again either. Frannie is the boss of the bunch and loves sitting in her pool when it is hot outside. Bernice is the rebel and likes to go exploring! They are both friendly with children and other animals. These girls would love a family of their own! Frannie and Bernice are available for adoption. They must go together. Frannie is a one year old, female (not yet spayed) mini pig. Bernice is a one year old (not yet spayed) pot bellied pig. They are suited for either a home or a farm. three generations of goats here! Jozie > Eliza > Addie. These lovely ladies are Nubian goats. They are so sweet and so funny! They love attention, climbing, and cuddling. They’ll be the first to greet you at feeding time. Wouldn’t they make a lovely addition to your hobby farm? Little Schwarber is just adorable. He looks just like a billy goat gruff. He’s hilarious and will always brighten your day. He does like to dig and escape from under fencing, so he needs a secure enclosure. He currently lives with Snowy the pony. Would you open your home to this handsome blue eyed boy? These animals are not ready for adoption - but after more training and rehabilitation, we hope to find them a forever home! Mirage came to us with her left eye sewn closed, a catheter still in her neck. Her eye had to be removed. It doesn’t stop her! Mirage loves going on trail and attention. She is currently in training at Transitions Equestrian Center in LaPorte, IN. She was used in our lesson program for awhile. We decided this girl is full of potential and has more to offer, so we sent her for further training. She is in her early teens and stands about 15.1hh. Warrior is a handsome, registered, 17 year old APHA gelding, standing 15.2hh. He is an in your pocket, can’t get close enough to you, kinda guy. He is losing vision in his right eye. He is a nervous boy, so needs a calm and confident partner. He can be a handful on the ground, needing a firm handler. For these reasons, he requires an experienced home. He is currently in training at Transitions Equestrian Center in LaPorte, IN.